"Increase the attention paid  by individuals and the media  to the art of poetry, to living poets, to our poetic heritage, and to poetry books and magazines. In the end, we hoped to achieve an increase in the visibility, presence, and accessibility of poetry in our culture." National Poetry Month has been a smashing success. According to the Academy it is now the largest literary celebration in the world. Bill Moyers has long been a champion of poetry, bringing poets and their work to television in numerous poetry series, including guests on BILL MOYERS JOURNAL and NOW WITH BILL MOYERS. You can explore highlights from the Moyers Poetry Archive in the player below. 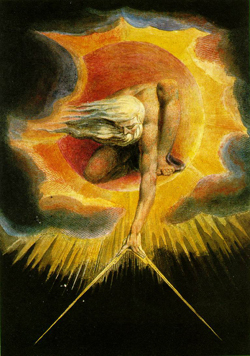 Picture: "Ancient of Days (God as Architect)" by poet and engraver William Blake, 1794. Relief etching with watercolor. Visit the Web site for Bill Moyers 1999 series, FOOLING WITH WORDS. View the entire broadcast online, Part I, Part II. The Academy's site is chock full of all things poetic, audio and video, writing tips, a calendar of poetry events throughout the year and material for teachers. Plus, there's 30 ways to celebrate National Poetry Month: Number 10: Google a poem. Many people carry single lines of verse with them, sometimes for years, and are eager to remember the rest of that particular poem. The poetry foundation has audio and video podcasts, essays, profiles of poets, poetry resources, and a section where users can browse by theme, poet, title, or first line. THE NEWSHOUR has been collaborating with the National Poetry Foundation on an on-air and online series. The Web site includes short-form profiles on living American poets and long-form segments on current debates in poetry and a wealth of resources for educators and the curious. PBS's Teachers offers advice on using multimedia resources in the classroom. April's expert Ian Ruderman contends: "Teaching poetry is one of the best things about being an English teacher." The site offers a wealth of resources for students of all ages. PBS's AMERICAN EXPERIENCE premiered a biography of Walt Whitman during 2008's National Poetry Month. Watch the whole show online and explore Whitman's New York, a timeline and weigh in on whether Whitman is really our national poet. Links to YouTube videos of poets reading their poems at the Geraldine R. Dodge Poetry Festival, as well as many other poetry resources. Information about New York City's Poets House, its programs and upcoming events.